Maintenance doesn’t have to be time or cost intensive. Always check the care label before commencing any cleaning. If you’re not sure, find out what type of material your window furnishings are made from, and keep a note of this for each type of window furnishing in your home. Different fabrics will require different care and cleaning, and knowing what materials you’re dealing with will avoid any potential disasters with using products or methods that aren’t appropriate for a particular type of fabric. A weekly once-over with the upholstery brush attachment on your vacuum cleaner is the easiest way to banish the dust and dirt that gradually collects on curtains. Start at the top and work your way down, ensuring you concentrate on hems, folds and pleats where dust can collect. Vacuum both sides of the curtains, as dirt can collect on the back side of curtains when the windows are open. Regular, gentle cleaning with the vacuum cleaner as part of your normal cleaning routine will help avoid a build-up and will make washing, when you need to, a lot easier and more effective. Before machine washing your curtains, double-check the care label to ensure that it’s ok to wash. Because curtains cop a lot of exposure to the sun, sunlight can gradually deteriorate the fabric so it’s important to take care when handling and washing them. Carefully remove any fixings and hardware (and make sure you keep them somewhere safe in the meantime!). Avoid overloading the washing machine. Always wash your curtains on delicate cycle, even if they are a heavy fabric. Cold water is safest to avoid possible shrinking or colours running. If your curtains are heavily stained, warm water will help to shift any stubborn dust or dirt, but always check the care label first. When in doubt, stick to washing in cold. Use a gentle laundry detergent without bleaches or optical brighteners. Try detergents that are formulated for delicates. Do a patch test on an area that’s not obvious first to make sure the detergent is safe for the fabric. 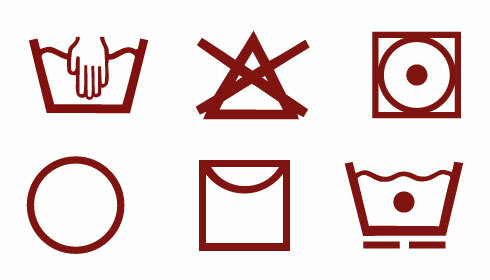 If you can, or for particularly delicate fabrics, skip the machine and wash by hand. Use the bath if your laundry tub isn’t large enough. Make sure the detergent is thoroughly dissolved in the water before adding the curtains, and wash them with a squeezing technique rather than rubbing them as it’s gentler on the fabric. Once you’ve washed, pop them in the washing machine on a slow spin cycle to drain any excess water before drying. Using a combination of tumble-drying and air drying is the best way to dry your curtains. Pop them in the drier on a low or no-heat cycle. It may take some time, but drying them this way will avoid shrinking, colour fade or setting in wrinkles that can happen on a hot cycle. Tumble-dry your curtains until they are just damp, then hang them back up on their rods to completely dry off. The weight of the moisture will help them hang better. If you’d prefer to line dry, just 15-20 minutes in the drier first will help to avoid wrinkles, after which you can hang them on the line to (almost) finish drying. Once you’ve hung your almost-dry curtains back on their rods, avoid vacuuming, opening windows and doors, or doing any other cleaning in the area until they’ve dried off properly. The damp fabric will atttract dust, undoing all of your hard work. Never hang wet curtains on their rods as they can drip onto your flooring or furniture. Check the care label to ensure steam cleaning is safe for your curtains. If they are machine-washable, they should be safe to steam clean. Follow the instructions for both the fabric care and steam cleaning unit. While they’re drying, close off any doors and windows to avoid dust movement and ensure that they stay clean while they finish drying. Many professional steam cleaning companies offer services for drapery. If in doubt, leave it to the experts as they’ll have the knowledge to make sure the job is done right. Not all dry cleaners are created equal, and just like doctors, each will have their own area of expertise. Do some research or ask for recommendations for a dry-cleaner that’s knowledgable about drapery and knows how to treat different fabrics. Enquire before you drop your curtains off to be cleaned – ask them if they specialise in furnishings or what their process is for your particular type of fabric curtains. Try to avoid dry-cleaning more often than you need to. Once every couple of years should be enough. The chemicals used in dry-cleaning can be harsh on fabrics and can deteriorate your curtains if used too often. Pop your curtains in the tumble-drier for ten minutes without heat. As soon as the machine stops, shake them out and re-hang them to avoid any wrinkles setting in. Use a lint roller to remove pet hair or bits of fluff. If you don’t have a lint roller, try some packing tape wrapped around your hand with the sticky side out. Use a damp cloth or sponge to gently remove any spots or stains. Hang your curtains on the clothesline on a nice day with a breeze to help air them out. Use a fabric freshener to eliminate odours. Do a patch test in an inconspicuous area first. And don’t forget the rods! While your curtains are drying, wipe down the rods and fittings with a soft cloth or give them a once-over with the vacuum cleaner. With a little regular care, your drapery will look better for longer and retain that new-home feeling long after they’ve been installed.